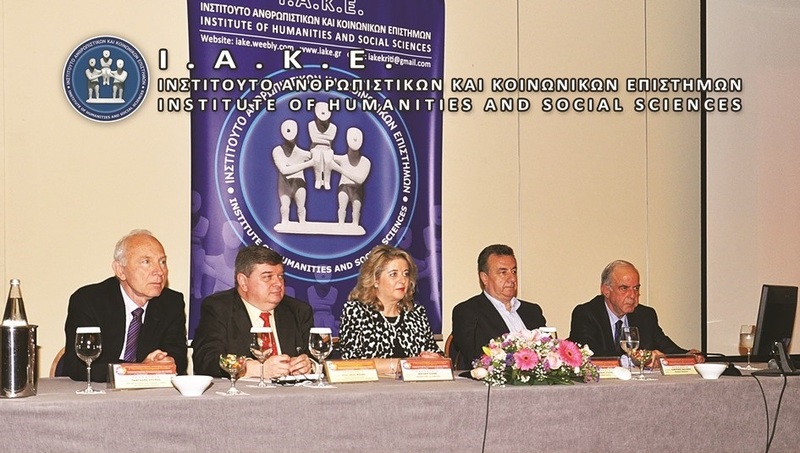 The “Institute of Humanities and Social Sciences” (IHSS) is a non-profit scientific association whose main purpose is the academic, theoretical, practical study and research in the fields of humanities, political and social sciences. It works on the basis of volunteering and solidarity, with the aim of raising awareness and activation of its members, society, educators and citizens to promote, advance, cultivate the humanities and social sciences. The development, implementation and dissemination of innovative practices, related to the sciences supported by the Institute, at local, national and supranational level. The provision of opportunities for education, training and acquisition of work experience in lifelong learning and adult education structures at national and European level. The development and dissemination of distance learning actions through the implementation and use of new technologies and networks. 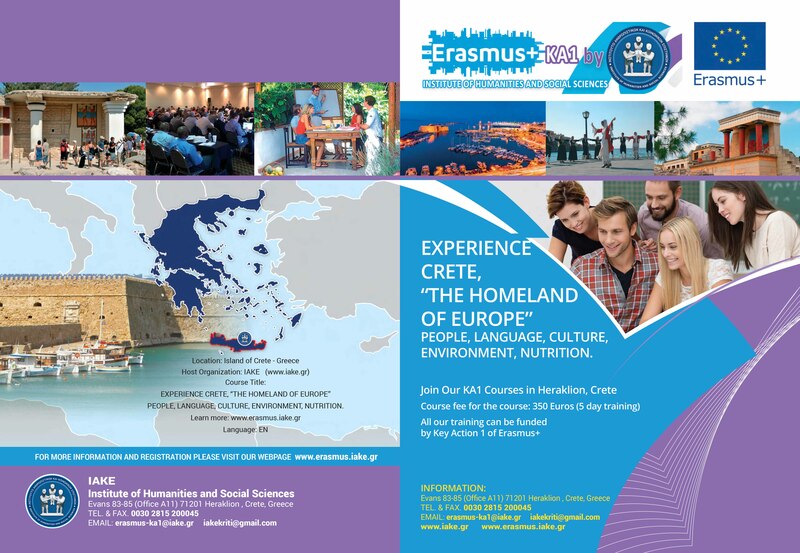 The organization of educational actions in collaboration with specialists, universities, formal, non-formal and informal education institutions in Greece and abroad, as well as other non-profit institutions, research centers and agencies. 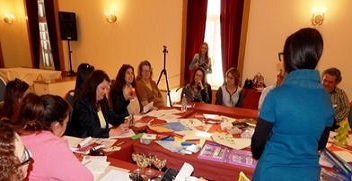 Design, implementation and evaluation of European education, training and professional development programs. 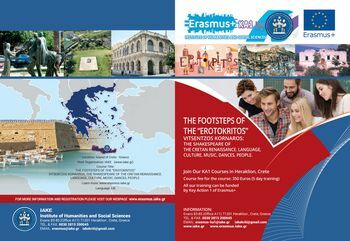 The cultivation, promotion, advancement and study of the language, history and culture of Greece, as well as the humanitarian, democratic, pedagogical and cultural values and principles of Europe. 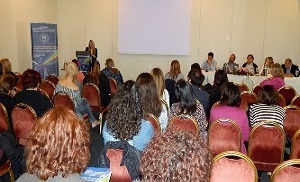 IHSS has already four very fertile and effective years of action in Heraklion, Crete and generally in Greece. 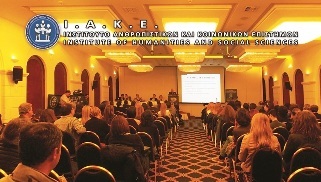 At this time he has organized and carried out three very successful Scientific Conferences with international participation, for which Minutes have been published and a rich archive material has been posted on its website: www.iake.gr. 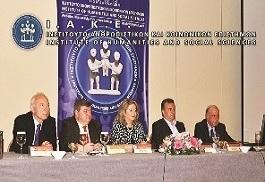 These three conferences have been attended by Professors coming from various Greek and European universities, as well as by a large number of researchers, scientists, managers, educators, teachers, undergraduate and postgraduate students and scholars in the areas of development, planning, innovation, sustainability, cultural management and communication. 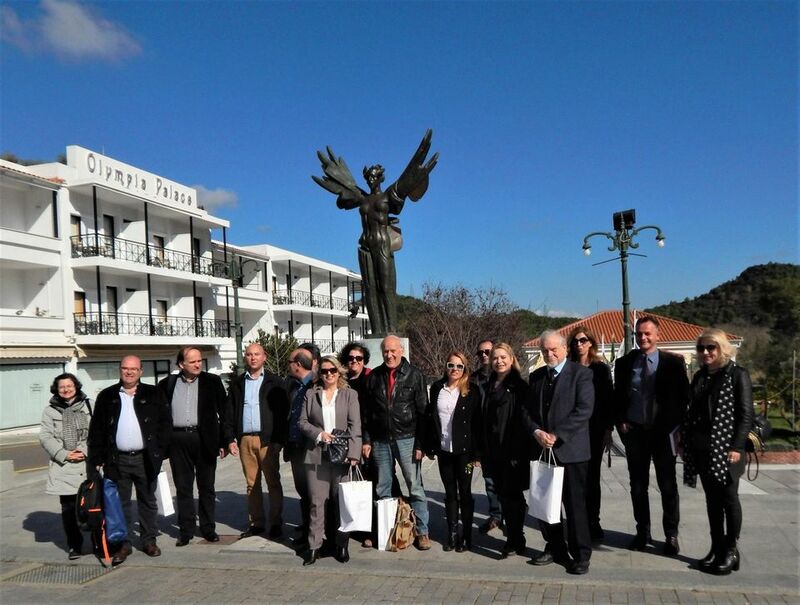 It is annually one of the most important events of the scientific and the wider community of Heraklion and the Region of Crete. Furthermore, IHSS has organized educational and scientific meetings and workshops in Heraklion, Athens, Salonica and elsewhere and has also participated in symposia and round table discussions at other conferences in Greece and Cyprus. 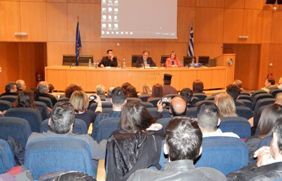 The 4th International Conference of IAEC, which will take place on 27, 28 and 29 April 2018, entitled "Democracy, rights and inequalities in the era of economic crisis. 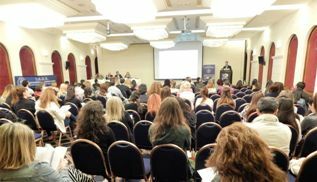 Challenges in the field of research and education", has been announced at this time. The announcement of this conference has already attracted the interest of the scientific community. 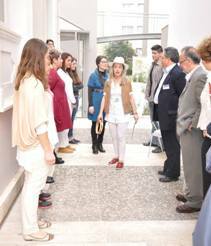 If you want to study the Cretan language and culture, you are in the right place! Through this program, trainees of all nationalities, adult learners, students, tourism professionals, teachers, etc. have the opportunity to attend a learning experience in another country. At the same time, they will improve their knowledge as well as their mental, psycho-emotional and social skills. Moreover, they are given the opportunity to improve their language skills, to come into contact with a new culture and to develop the sense of European consciousness and identity. IHSS’s commitment to academic knowledge, high quality education and guaranteeing proper recognition of student learning outcomes will meet all expectations. From the "Tavrokathapsia" of Knosos to the arenas of modern bullfighters. If you want to study the Minoan civilization, then you are at the right place! Through this program, trainees of all nationalities, adult learners, students, teachers, etc. 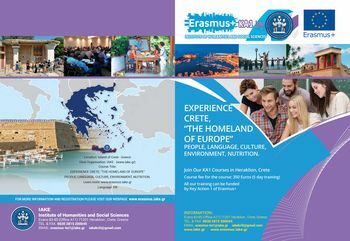 have the opportunity to experience a learning experience in another country and to acquire knowledge and skills for Europe’s most famous and ancient culture. At the same time, they will improve their linguistic, mental, psycho-emotional and social skills while having the opportunity to interact with a new culture and develop a sense of European consciousness and identity. IAKE’s commitment to academic knowledge, high quality education and guaranteeing proper recognition of learning outcomes for trainees will overcome all your expectations. The footsteps of the the "Erotokritos"
Vitsentzos Kornaros: The Skakespeare of the Cretan Renaissance. Language, Culture, Music, Dances, People. This program about the culture of Crete is being developed in the beautiful city of Heraklion, but also in other towns and villages of the most beautiful island of Southern Greece. 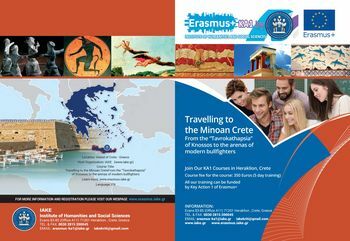 Trainers will have the opportunity to know, study and explore the richness of this culture, especially the linguistic idiom that gave birth to one of the greatest masterpieces of Cretan and Greek literature. 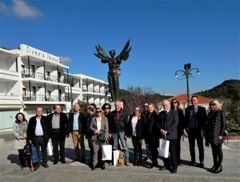 The aim of the program is to create and develop strong links between citizens from different countries through acquaintance with important works of European literature. At the same time, trainers of all nationalities, adult learners , students, tourism professionals, teachers, etc. will improve their mental, psycho-emotional and social skills through group and cooperative activities. IHSS'S commitment to academic knowledge and high quality education will overcome all your expectations.